Keep Your Pets Safe on Halloween! It’s that time of year again, when we can dress up in crazy costumes, carve pumpkins, and eat candy until we collapse into a sugar coma. Many of us at Eagle Ridge Animal and Bird Hospital also like dressing up our pets and letting them join in on the fun! Here are some tips for keeping your furry family members safe this Halloween. Fireworks, excited children, parties – Halloween can fill your neighbourhood with lots of extra noise and activity. Your pets can find all this stimulation alarming, and may try to escape, hide, or even become aggressive. It’s best to keep your pets indoors on Halloween to keep them safe. If they seem anxious, try placing them in a quiet room or crate. If you are taking your dogs with you trick or treating, or to a party, keep them near you so that you can reassure them if they become fearful. Some pets become very distressed when they hear fireworks. If you have experienced this before, talk to your veterinarian to see if a mild sedative or anti anxiety medication might be helpful. Who doesn’t love Halloween candy? Just make sure you keep the treats for humans only! Chocolate is toxic to dogs, cats, birds, rabbits and rodents. The sugar and fat in candy can cause stomach upsets. Birds and pocket pets may be attracted to colourful candy wrappers, which can end up blocking their intestinal tracts. Many dogs will also wolf down candies, wrappers and all. This can lead to stomach upsets, blocked intestines, and chocolate poisoning. Chocolate poisoning is caused by a substance called theobromine. Toxic doses of chocolate depend on the amount of chocolate eaten, the type of chocolate, and the weight of your pet. If your pet has ingested any amount of chocolate, call us at Eagle Ridge Animal and Bird Hospital (604-464-3343), or your local animal emergency clinic outside of clinic hours. A veterinarian will be able to tell you if your pet has ingested a harmful amount of chocolate, and what treatments are necessary. Is there anything cuter than a dachshund dressed as a hot dog? 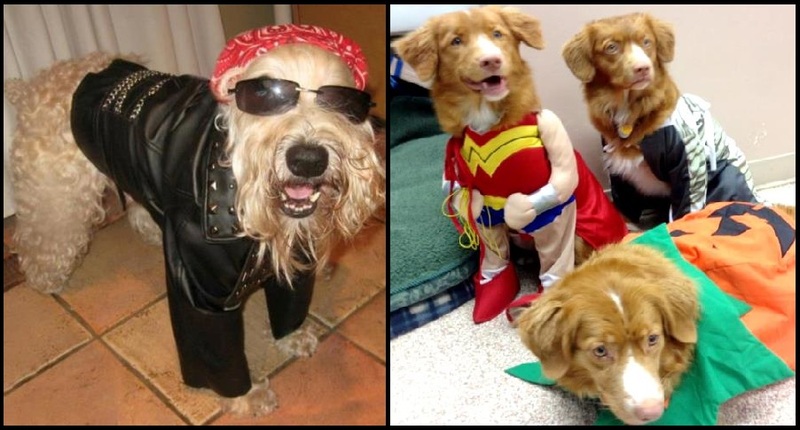 Dressing up your pets for Halloween is great fun and creates amazing photo opportunities. A pet should never be left alone or unsupervised in a costume. Some pets may chew up their outfits and ingest them, which could cause intestinal obstruction. For this reason costumes should also be made of non-toxic materials. If the costumed pet escapes or is frightened away, the costume could get caught on trees, fences or bushes, and your pet could get hurt or stuck in the process. Happy Howl-o-ween from the staff at Eagle Ridge Animal and Bird Hospital! Have fun and stay safe.